Sure enough, trying to find the 10 hardest logic and/or number puzzles is all good and well, but what about us mere mortals? Puzzles should be entertaining, a short and mild diversion, and not keep you up three nights in a row. So for everyone who's looking for puzzles that are definitely not taxing, this page is for you! 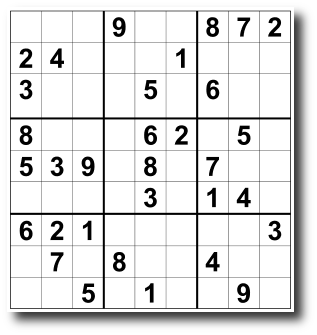 There are quite a few super-easy Sudoku puzzles out there, and after months of research we think we found the easiest! Experts have rated this puzzle "-10 out of 5 stars" and "Are you kidding?" 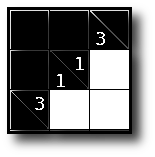 In a 2×2 Calcudoku each row and each column has the numbers 1 and 2 exactly once. The numbers in the group of cells marked with 5+ should be 5 when added together. 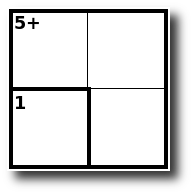 So: do your analysis, get started, and good luck :-) You can find slightly harder Calcudoku puzzles at calcudoku.org. 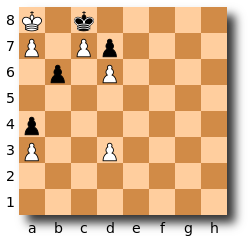 Now you can finally brag you can solve a "white to mate in 6" chess problem :-) (as seen on the Wikipedia page on Joke chess problems) (white to move). David Filmer (david(at)flockman(dot)com) sent in this easiest Sudoku starting with 32 clues. He challenges anyone to find an even easier one (send yours to him or use the form below). The Kakuro puzzle combines elements of Sudoku, logic, crosswords, and basic math into one. 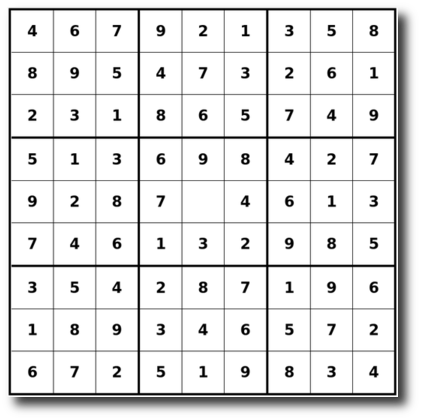 From the Wikipedia page on Kakuro: "The objective of the puzzle is to insert a digit from 1 to 9 inclusive into each white cell such that the sum of the numbers in each entry matches the clue associated with it and that no digit is duplicated in any entry". Fill-a-Pix is a Minesweeper-like puzzle based on a grid with a pixilated picture hidden inside. 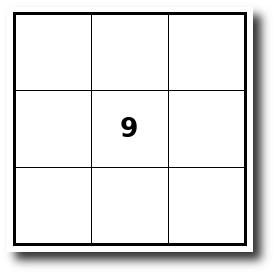 The cells with a number show how many cells in the 3×3 grid should be black. What mysterious image is hidden in the grid below?? 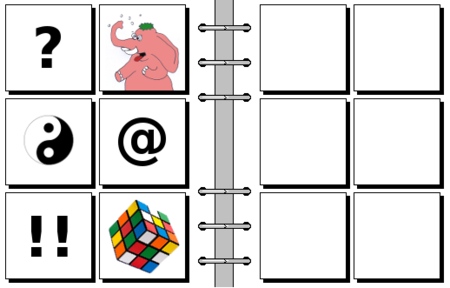 For more about Fill-a-Pix, check the Get started section on conceptispuzzles.com. They became more widely known after Douglas Hofstadter mentioned them in his book "Gödel, Escher, Bach". Easily the most information on Bongard problems can be found on Harry Foundalis' site.